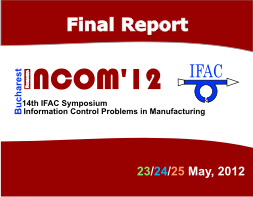 Registration for the 14th edition of IFAC’s Symposium INCOM 2012 will be open on February 06. To register, please fill in (one form per participant) and return the Registration Form by fax or e-mail to the Symposium Secretariat. Please review the registration and refund policy carefully as refund penalties may apply. In case of any question about registration rates and/or refund policy, please contact the Organizing Secretariat (e-mail: incom12@cimr.pub.ro ). * Deadline for final (camera ready) paper uploads March 26, 2012. Final papers will be included in the INCOM'12 Preprints and Proceedings Volume only if Registration Fees are paid until March 26, 2012. ** The full program for accompanying persons includes the Symposium banquet, Gala dinner and one Bucharest Panoramic Tour. Registrations by Registration Form are available until March 26. After that date you can register to the Symposium on site, starting from May 22, 2012. *** For final submission, Regular or Special Sessions papers should be 6 pages long (12 pages for plenary papers). Any additional page will be charged € 80,00, up to a maximum of 2 extra pages. For payment by credit card a handling fee of 10 € will be added to the registration fee and authorized for payment. Bank charges for wire transfer must be supported by the sender. To insure proper credit to your account, you must specify in the “Transaction Description” area: REGISTRATION FEE for INCOM’12, the attendee’s name and the code of the paper. Please send a proof of payment (copy of wire transfer certified by your bank). Regular registrants: The registration fee includes access to technical sessions, Symposium proceedings, coffee breaks, lunches, Symposium banquet and Gala dinner. Regular registrants are entitled to upload up to two final papers. Additional papers may be uploaded under a further payment of € 325, 00 each. Student registrants: if at the time of registration or at the time of initial submission of paper for review the registrant is a “full-time student” at a certified institution, she/he may register at student rate. The registrant will be required to provide evidence of full-time student status. This registration fee includes access to technical sessions, Symposium proceedings, coffee breaks, opening and closing receptions. Student registrants are entitled to upload one final paper. Accompanying persons: the registration fee includes access to the Symposium banquet, the Gala dinner and one Bucharest Panoramic Tour. Neither the Organizing Committee nor the Symposium Secretariat will accept liability for any damage and/or loss that may be incurred by a Symposium participant or his/her companion during the activities of the Symposium or the social activities connected with the Symposium. The participants take part in all tours and events connected with the Symposium at their own risk. Participants are advised to charge any loss or damage they may incur during the Symposium or the travel to and from the Symposium location to their insurance. The Organizers of the Symposium shall not accept any responsibility for the individual medical, travel, or personal insurance of the participants in the Symposium. All participants are strongly advised to obtain a personal insurance before attending the Symposium. The Organizers will not be responsible for the loss or damage of the participants’ personal belongings. 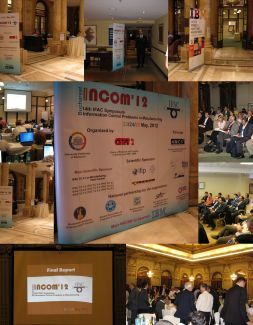 The organizers reserve the right to cancel without notice or compensation the 14th IFAC Symposium INCOM 2012 in the event of force majeure cases (for example, but not limited to, acts of nature such as fire, earthquake, flood or terrorist attacks). In such cases, the organizers are freed of all responsibility and no liability for any claim for damages and/or losses will be accepted. Limitation of liability of organization: In the event of it being impossible to carry out the 14th IFAC Symposium INCOM 2012 for force majeure cases, so long as this arises from a cause not attributable to the organizers, the organization shall only be obliged to reimburse the payments received subject to deduction of any costs it has incurred in preparing the event. This liability only extends to the payments made directly to Symposium organization and not to payments made by the attendees to the hotel or airlines. The applicable law is the Romanian law. Any dispute, controversy or claim arising out of or in relation to this contract shall be resolved under the exclusive jurisdiction of the Court of Bucharest.